I love Oysters. Growing up in Daytona Beach made it very convenient to go get a bucket of Oysters without breaking the bank. One of my favorite local places there is the Oyster Pub. When we moved to Tampa, one of the things I noticed is Oysters are very expensive. One would think that being on the gulf, it wouldn't be that way. I can't justify spending $3 an oyster, especially when I easily take down 3 dozen in one sitting. In May, Tasting Tampa posted a blog about a restaurant near Busch Gardens called Captain Just's Crab House. I had a craving for Oysters yesterday and we ventured out and boy are we happy we did just that. Captain Just's is located directly across the street from Yuengling Brewery and with this place, you don't want to judge a book by it's cover. Make sure you check in on Foursquare so you can receive a free draft beer (I got a Yuengling of course). They have a daily happy hour from 11:00-8:00 and you can score draft beer for only $1.25. My two yuenglings cost less than Gabe's Coke. I love when that happens! 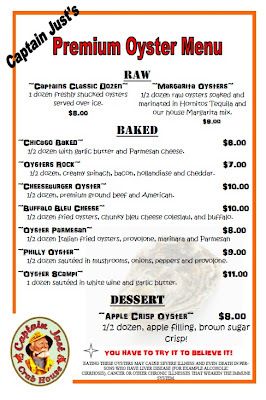 Check out the Oyster Menu! First the prices are amazing, only $8 for a dozen of classic oysters. Second, they have the largest selection of specialty Oysters I have ever seen. Dessert Oysters!? I had all intentions of ordering the Apple Crisp Oyster - I just couldn't bring myself to do so once I got there. I chickened out. I started off with a dozen of the classic, lightly steamed. They were very good. I then went for a traditional specialty oyster. This girl couldn't cheeseburger oysters. I ordered the Oysters Rock - also known as Oysters Rockefeller. Half a dozen only sent me back $7. Amazing! Gabe tried their Chicago Baked Oysters, which were Garlic Butter & Parmesan. Sounded greatly like Acme Oyster House charbroiled oysters. Half a dozen for only $6. He also got their chicken wings but I didn't get a shot of them. Gabe mentioned close to 10 times that he loved Captain Just's and he couldn't wait to go back. The oysters were amazing, the prices were very good. 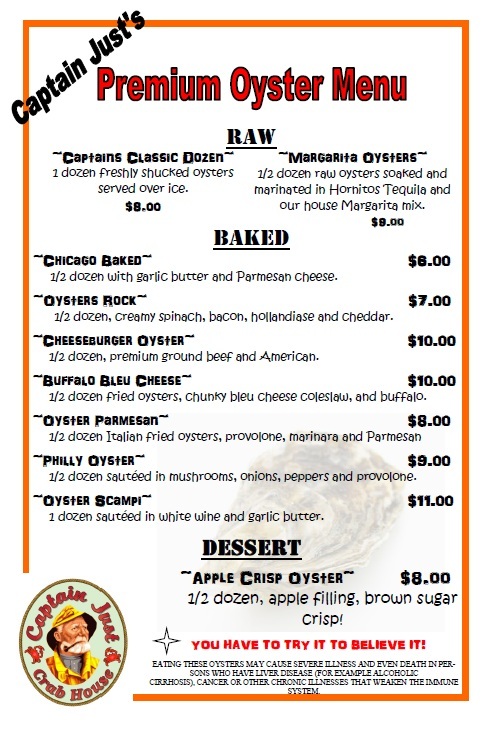 If you were looking for something other than oysters, they have a pretty decent menu with options for everyone. It was definitely worth the trip to that side of Tampa. I still can't get over the Apple Crisp Oysters and would love to know if anyone is daring enough to try them.